Linderhof’s history began as a hunting lodge of Maximilian II that Ludwig II had dismantled and reassembled in the park in 1872. 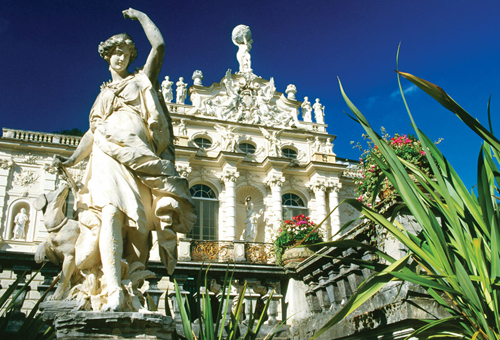 Originally planned as a second Versailles, the castle turned out to be far more modest in scale, albeit designed in a delightful and whimsical neo-Rococo style. Set in a landscape garden, the park is a French-style formal garden created from 1870 onwards using designs by Carl von Effner. Its parterres are reminiscent of the Baroque style, its terraces of the Renaissance. On the north side of the castle, cascades flow across 30 steps bounded by the Fountain of Neptune at the bottom and the music pavilion at the top. Arcades flank the two sides of the waterfall. Designed to emulate the Hörselberg in Wagner’s opera, Tannhäuser, this artificial grotto, complete with stalactites, features a lake on which the king was rowed about in a gilded barge. 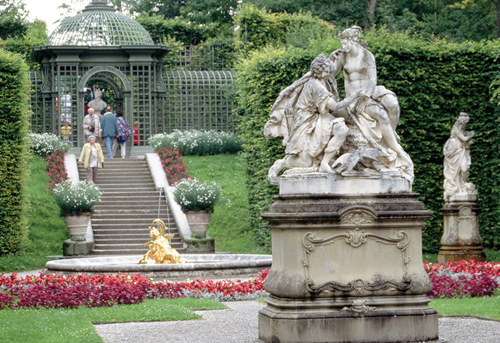 Created for the Paris World’s Fair in 1867, Ludwig II acquired the pavilion for Linderhof in 1876. This is the oldest structure of the castle complex, built in 1668 as the chapel of St Anna. 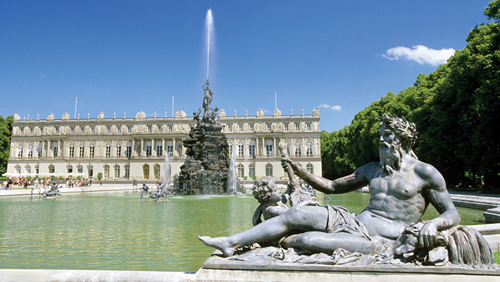 On the island of Herrenchiemsee in Lake Chiemsee, Ludwig II finally began to build his “New Versailles” in 1878. Seven years later, he ran out of funds after completing 20 magnificent rooms, which are open to visitors today. The museum is housed in the south wing of the New Castle and documents the life of “Kini,” a Bavarian nickname for the king, in a series of 12 rooms. Another homage to Versailles are the gardens on the west side of the castle, where water features enchant visitors from May to October. With a picturesque view of the castle and Lake Chiemsee, this is a wonderful place for a stroll. Horse-drawn carriages run from the ferry dock to the castle. “Kini’s” building mania began in 1867. At first, he concentrated his efforts in Munich, where he redesigned his private palace apartments. But he was already planning his fairy-tale castles. 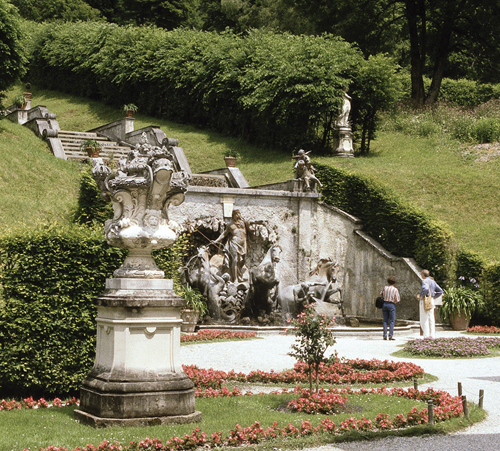 In 1868, he developed the plans for Linderhof – the only castle to be completed. After work started at Neuschwanstein in 1869, Ludwig focused entirely on the Hohenschwangau region. Construction on Herrenchiemsee Castle began in 1878; Ludwig spent a mere nine days there. Projects were planned for Munich, too, including a festival hall for Wagner operas (of which a smaller version was built in Bayreuth in 1876). By 1886, Ludwig was in debt by 14 million marks. With bankruptcy looming, the King was removed from power, and died shortly thereafter.